You know the old saying… if life gives you cauliflower, make pizza crust. What, that’s not a saying?! Well, I propose right here and now that it should be. We all know cauliflower is a pretty great vegetable, sure. But do you know just how versatile it is? Did you know you can take a head of the stuff and make, yes, a pizza crust? Or a lightened-up version of mashed potatoes? How about hummus? Rice?! Popcorn! Buffalo wings!! This incredible cruciferous vegetable isn’t only low in carbohydrates (perfect for those eating lower-carb diets); it’s utterly packed with nutrients. So the fact that you can transform it into a myriad of other things—usually as as substitute for something that would have been far more calorie-dense—it’s a very good thing. Here are 20 brilliant cauliflower recipes from around the web that touch upon the infinite possibilities for this one remarkable vegetable. Description: Cauliflower really does work as an incredible stand-in for chicken. Not completely convinced? The Bakeaholic Mama does the trick with this incredible General Tso’s Cauliflower. I have had the pulled cauliflower bbq sandwiches before and I LOVED them!! You can never go wrong with pizza crust and rice though, too! I cannot WAIT to try those sandwiches. So creative! Love love love cauliflower! It’s the best “secret” ingredient ever. Mmmm I made those cauli bites with vegan ranch for the superbowl and they were insane!!! YUMYUM. I love your beautiful website. So pretty and so delicious. I had a question about blogging etiquette. When you do a round-up like this, do you have to ask all the authors individually for permission to use their recipes/photos or is it simply OK to give credit to them. Thanks so much! Hi Ruta! Thank you for the nice words! In round-ups such as these, we do make sure it’s okay with individual bloggers before including their photos, and we link directly to the recipe on their blogs. When I started my cauli-research, I was floored by the sheer creativity! So much you can do with one miraculous veggie. 🙂 Your burrito bowls are GORGEOUS! Great collection! The hubs will only eat well-hidden cauliflower, so these are needed so I can get my fix! I am a HUGE fan of cauliflowers! This is a great collection, Kare. It’s such an incredible veggie, isn’t it?! That’s a good point. My toddler is super picky but will eat most anything if it’s got crispy parts. I think I’m going to have to see how she does with cauliflower pizza crust or breadsticks sometime soon! Cauliflower really is the new kale! So many great ideas here. Thanks for sharing. Top of my list is the smoked paprika popcorn cauliflower. Doesn’t that look incredible?! I’ve made cauliflower “popcorn” before but when I saw the smoked paprika … mind blown. I’ve been obsessed with cauliflower lately so the timing for this round-up is perfect! I’m pretty obsessed, too. Such a wonder veggie. I cannot wait to make that buffalo cauliflower dip. The ONE thing I semi miss about being a meat eater are chicken wings! I have yet to give into any cravings…buuuut now that there is a cauliflower version I will be making these ASAP! I’m so excited! I am drooling over this list!! Thanks for the mac and cheese shout out! I am endlessly amazed at cauli’s versatility!! I can’t wait to try all of these! I know, right?! Is there anything it can’t do? Well, maybe my taxes. I sure *wish* it could do my taxes. Perfect timing! I’ve been developing a cauliflower obsession and now I have a list to work from. Thank you. =) I just made the pizza, it was so good that the guys at work were forced to look at it and hear ALL about it. So good! I did flip the crust halfway through and then broiled each side for a few minutes. That, plus mixing the cheese with half parmesan made it an eat with your hands, fold it half, New York kinda slice. Thank you for the steady stream of great recipes and ideas! NY-style cauliflower pizza. I’m totally drooling! Ohhh cauliflower is my favorite so this is my dream collection! *Cauliflower Crazy* I can’t get enough cauliflower! 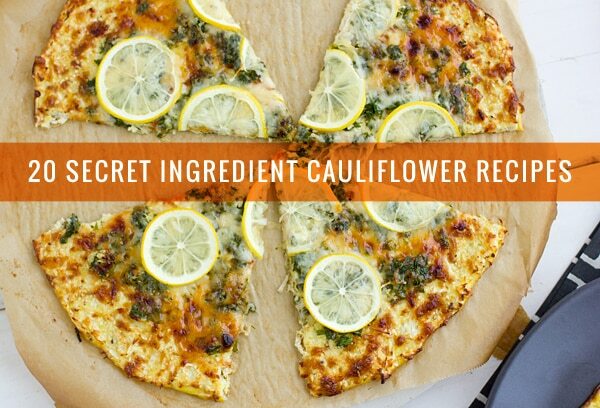 While your sneaking in cauliflower in recipes, it is easy to sneak other stuff too! What great recipes for cauliflower! Love the looks of that pizza. I just noticed that you have a book on pro biotic drinks. How do I go about getting a copy? I would love to share this on my blog since I am just getting started learning about this. Hi Alicia, thank you! Delicious Probiotic Drinks was written by fellow Oh My Veggies contributor Julia Mueller. You can find out more/get contact info by visiting her blog, theroastedroot.net. Such a great book! OMG! I just started wheat belly lifestyle and broke up with my beloved “potato” 🙁 and found mashed cauliflower 🙂 I could eat it everyday! !…however had no idea it could be turned into pizza crust!!!!! Okay I think I love you guys!!! 🙂 Can’t wait to try it and the other recipes mentioned here!!! My husband actually found this blog!! ha ha!! Thank you…Thank you….Thank you!!!! I love how versatile cauliflower is, and the variety of recipes in this round-up showcases that beautifully! Thanks so much for including me. Are there links for these recipes? An earlier comment suggests yes, but I’m not seeing anything. Tks!